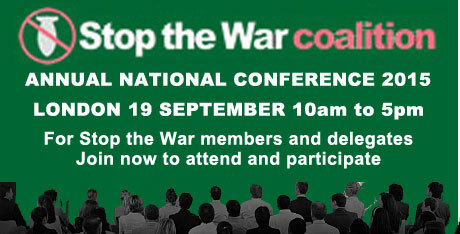 SACC Motion agreed overwhelmingly at the Stop the War Coalition Annual Conference, London, 19 September 2015. Conference is concerned at the continuing threat to democracy, peace and community relations posed by the Prevent strategy and deplores its embodiment into UK law under the Counter Terrorism and Security Act 2015 (CTSA). 'Prevent' is coercive propaganda that legitimises UK wars, institutionalises Islamophobia and intimidates Muslims who dissent from UK Government policy. Intelligence and security agencies and police should have no role in shaping or monitoring political discourse in the UK. The construction and coercive promotion of 'British values' is racist, islamophobic and reactionary. The government's attempt to determine what Muslims may and may not believe damages civil society, amounts to social engineering, and is unacceptable. 'Prevent' has no part to play in countering the UK's far-right organisations or the Islamic State. Calls for the repeal of the CTSA and the scrapping of 'Prevent'. Supports the right of everyone to criticise and peacefully oppose UK and "Western" intervention overseas. Calls for solidarity with workers who find themselves in difficulty because they have refused to cooperate with 'Prevent' in their workplace, and with people subjected to monitoring under 'Prevent'. Supports the stand taken by the NUS and UCU against 'Prevent', especially the NUS decision not to engage with 'Prevent', and the UCU decision to boycott 'Prevent'. Urges STWC local groups to work with trade unions to counter the islamophobic and pro-war outlook promoted by 'Prevent'. Urges STWC local groups to work with other groups, including CAGE, the Islamic Human Rights Commission, the Campaign Against Criminalising Communities and Scotland Against Criminalising Communities to oppose 'Prevent'.